Further to my email yesterday, I had a further opportunity to speak to Mayor Crombie, various Councillors and the City Solicitor. I have been advised that the Motion would not be supported by the majority of Council. From discussion at yesterday’s Council meeting, I expected this response however, I wanted to ensure an opportunity was available for anyone in the community to speak to the matter if they wish. As the Motion will not be on the Agenda, unfortunately, the community will not have the opportunity to speak at General Committee on May 30. This was my final opportunity to attempt to hold PDSB accountable for this project as all other avenues have been completely exhausted. I encourage you to continue to contact Sue Lawton, your PDSB Trustee should you have any additional questions or concerns. At Council on April 25th, I brought forward the resolution below. I wanted to bring you up to date on what measures I have taken to persuade the Peel District School Board, the School Board Chair and Ward 3 School Board Trustee to postpone construction and hold a community meeting. As your Ward Councillor I believe it is imperative to ensure the community is informed of any major changes that may impact surrounding residents and, in most cases hold a community meeting for an opportunity to hear your concerns and questions. I have heard from many residents in this community and have been advocating the School Board to do the same. I continue to follow up with all parties involved by phone, letter and email. I have also prepared a Notice of Motion to go before Council on Wednesday, April 25, 2018 to attempt to receive Council’s support. 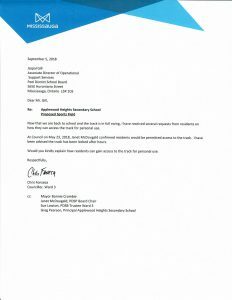 Finally, please find attached letters I have sent to Janet McDougald, PDSB Chair, Sue Lawton PDSB Trustee for Ward 3 and Jaspal Gill, Associate Director of Operational Support Services. Unfortunately, the City’s hands are tied as the City nor myself have any jurisdiction on School Board issues. Sue Lawton, School Board Trustee for Ward 3 represents you at the School Board level as I do at the City and Regional level. I have reviewed with the City’s Planning Department, Recreation Department and Building/Zoning Department to see if there is any City mechanism in place that would allow me to hold a community meeting. Unfortunately, there is not and I encourage you to continue to contact Ms. Lawton at susan.lawton@peelsb.com as I will be doing as well. NEW UPDATE – I am very pleased to advise that last night I received the following invitation from the School Board Trustee and plan on attending. On behalf of the Peel District School Board and Community Sports Partners, I invite you to drop in to Applewood Heights Secondary School on Wednesday April 25th between 4:00 and 7:00 to view a drawing of the field and track. David Gisborne, CSP, PDSB senior facilities team, and Principal Greg Pearson will be available for individual discussion should you have a question not yet answered. As always, I am happy to answer any further questions or concerns.